If you have gymnasts, dancers or animal lovers in the family — and your kids can make it to 10:30 p.m. without a meltdown — this dazzling show at Marymoor Park is worth springing for. In our family, my big brother was the resident horse fanatic. He rode every week for years, but my only memory of getting near a horse isn't fun at all: Picture a freaked-out toddler, a giant animal and a birthday party gone terribly awry. Tickets: Adult $59.50–$259.50, Junior (3–17) $54.50–$234.50, Child (2–12), $44.50–$184.50. Low end = "partly obstructed view"; high end = VIP Premium with lounge access. Buy online at cavalia.net. Fast-forward a few decades and several horse-loving friends and boyfriends, though, and you'll find me chomping at the bit (sorry, had to) when the chance to see Cavalia's Odysseo came around. I couldn't say yes quickly enough. 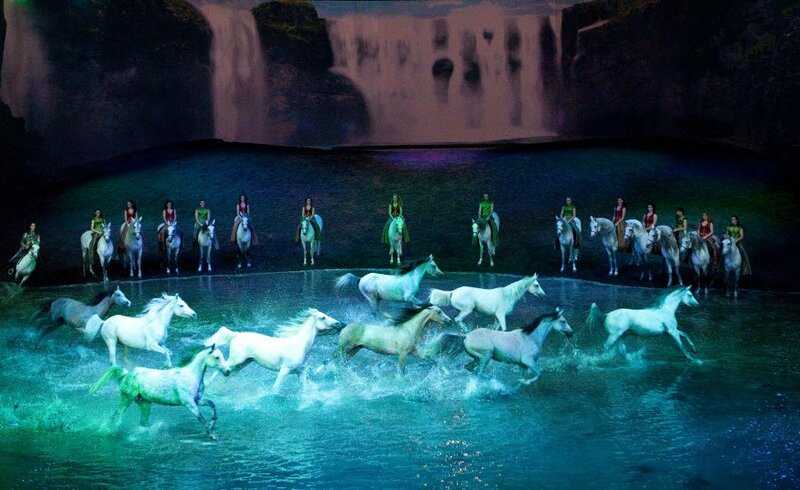 If you've been to anything by Cirque du Soleil, you have a good idea what to expect from Odysseo. Only this time, along with human acrobats twisting into impossible shapes, you get a fleet of incredibly well-trained horses whose feats are just as impressive. From the outside, the big top looks as big as you'd imagine; but inside, the performance space feels cozy, with an ethereal forest setting and an indigo "sky" overhead. As they wait for showtime, kids and adults are entertained by a quiz about the horses projected onto the curtain (and, if they're lucky, by a celebrity sighting — Tom Skerritt was seated a few rows away from us on opening night with his family, looking delighted). Then the curtain parts, and the ride begins: Horses prance, run, side step and at one point actually dance across the stage, often in synchronized groups, as trainers guide them with barely perceptible words and movements. It's really something — and so are the human performers, especially a troupe of Guinean acrobat-musicians whose playful energy and mind-blowing tumbling anchor the show. Emerson, 5, loved "the carousel!" and Harper, 7, "thought it was really cool when those guys did the backflip thingies" and later "flipped off the horses." The other kids I chatted with at intermission, ages 8 and 11, also lit up when they talked about the acrobats. Watching such powerful animals sprint in an elegant circle or curl up gently on the ground is enchanting — but it's hard not to root for the gent backflipping 15 times in a row or the lady hanging by her ankles off a metal hoop high in the air. And the relationship between the horses and their handlers is genuinely moving. 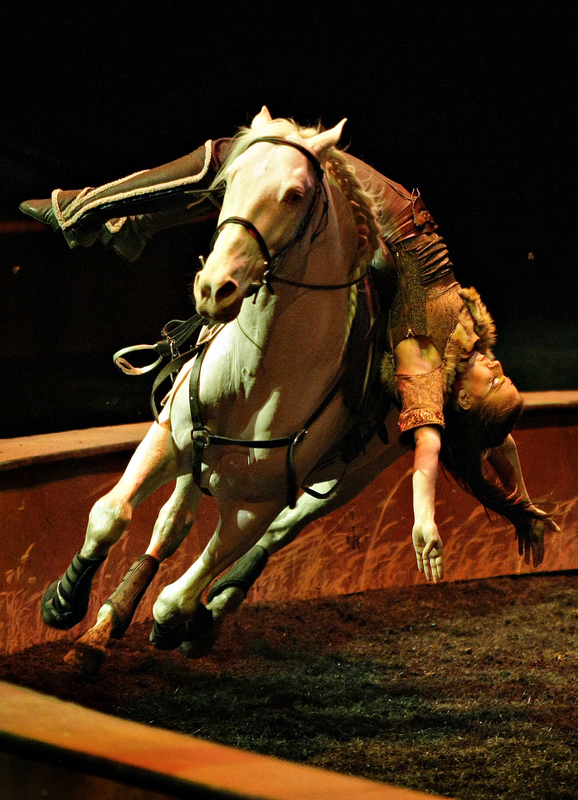 Cavalia's website gives parents a respectful nod: "We realize each child is an individual, and you will know best how comfortable he/she would be at a show of this length." That said, here's my two cents: Tweens and teens will love the spectacle! Younger horse-obsessed kids will also thrill to the animals' energy and grace, but the loud music and frequent bursts of applause might overwhelm the under-7 set. They're also likely to have a hard time sitting still for the whole show, especially at evening performances, which begin at 7:30 or 8 and run long past bedtime. Children's tickets start at age 2 — the noise and lights are too much for babes in arms (and most toddlers on laps). - Parking is free and crowded. Unless you're an early bird, be prepared for a longish walk across grass and gravel to reach the big top. - There aren't any dinner options onsite, but movie-style snacks are available for sale: Kids will make a beeline for the popcorn and ice cream, while their chaperones might sip on a glass of sangria. If you opt for VIP access, your family will enjoy a complimentary buffet and drinks before the show, plus a dessert bar at intermission and a tour of the stables afterward. - Keep in mind that no photography or recording is allowed during the performance — for real. Spooked horses are serious business.